After moderating last week’s EAP panel on “Building Community Through Technology” and live-tweeting this past Monday’s crowded “Beyond Dynamic Adaptability” conference, my brain is swimming in the blurry waters inhabited by words like audience, artists, network, and community. James Kass (YouthSpeaks) and Robin Wu (ZeroDivide) agreed last week that the platforms for online engagement are changing so quickly that it’s unwise to invest deeply in one method or a specific tool. This message was echoed throughout Monday’s conference, particularly in the afternoon session I attended, which was hosted by social media guru Beth Kanter. Anita Jackson (Moms Rising): Take an interweaved approach to engagement through “layer cake” marketing– multiple approaches and outlets with a unifying message. Mark Taylor (KQED): Acknowledge and overcome fear of failure in order to innovate. Digital tools allow us to constantly reinvent; analog=finished, digital=in process. Marc Vogl (BAVC): Consider carefully your audience’s expectations (especially creature comforts like ticket-buying experience and parking) and gratify them. Tamara Alvarado (1st Act Silicon Valley): Make your space welcoming to people with a variety of backgrounds, and remember that existing norms might be preventing them from feeling welcome. Michella Rivera-Gravage (CAAM): Integrate engagement strategies with programming process to attract audiences to the work of your organization throughout the process. Annika Nonhebel (AXIS Dance): For small organizations, leverage the affordability of social media by making it a daily practice, and being smart about why you’re using it. 1.) Is this glorified marketing, or is it fundamental change? 2.) Does anyone really know what they’re doing with social media? That afternoon session was framed with the question: “How can technology help enrich networks of participation?” Certainly Kanter’s proposal of a “networked nonprofit” and Nina Simon’s buzz-inducing discussion of her innovations at the Santa Cruz Museum of Art and History have both network and participation at the core of their being. Simon’s sticky-note driven community brainstorms and 72-hour program inventions prove that a new way of thinking (in this case, design thinking) can fundamentally transform and renew an institution. But the dominant paradigm, especially for performing arts presenters, seems to swim against this tide. Conventionally, the creative artist and the show/art object are the locus of value, and delivering degrees of access creates the cost structure (think: donor dinner with the soloist). Much of the afternoon conversation proposed new answers to two old questions: how to attract customers, and how to retain them. I might just be allergic to “tools and tips” conversations, but I was alarmed by the idea that our deepest response to social networking would be to now blast our message out in five channels instead of four. Not only do we often lack the resources to do it, it falls short of recognizing the radical transformation that Simon and others propose. That said, one tidbit that caught my ear was when Simon characterized the changes at the MAH as transforming the place into a civic institution. She made it quite clear that she was “not there for the artists.” I’m sure, given the time for nuance, she’d include the artists as part of her community, but this point stung my artist/administrator heart a bit. Certainly large institutions, especially those managing exhibition spaces, are a special situation. 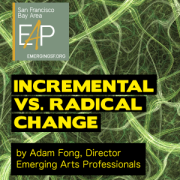 But since the majority of our arts non-profits do not run their own space, and are frequently run by a founding artist or a small group of artists, it may be a radical departure to posit that the organization is not centered around serving artists (or the Artistic Director) and their work. On the other hand, Kass, Jennifer Maerz (The Bold Italic), and others stated with complete certainty that their efforts to build community online are ultimately intended to drive people to old-fashioned live performances. Going a step further, our panel posited that as an organization, knowing who you are is what allows you to embrace new tech tools, experiment with new ideas, and meanwhile never lose sight of the purpose of your work. Recently Ken Foster (Yerba Buena Center for the Arts) came to speak to our EAP Fellows. One of the suggestions from his paper “Thriving In an Uncertain World” that seemed to strike a chord was, “Behave like an artist.” We heard the same message in different terms on Thursday’s panel, when Tanya Vlach (EyeTanya) suggested that engaging with negative or challenging comments on her blog had opened up new ideas and understandings. And again at Monday’s conference, Kanter and many others emphasized that experimentation and a willingness to fail were critical habits for innovation through incremental change. We may not know where we’re going with our social media efforts, how precisely to measure our success, or whether creating more opportunities for participation will eventually do more than cultivate ticket purchases and donations. But if we have a deep understanding of our mission, it does allow us to embrace new possibilities, test new methods, and create new ways to connect and co-opt people into the work of fulfilling that mission. Do you want Facebook to be your “new focus group” or your theater’s back row to be full of “tweeps”? Doing a gut-check on how your leaders define your mission might make it easy to embrace those rather incremental changes, or in some cases reveal a need for changes far more radical. EAP and the Foundation Center San Francisco co-hosted the Building Community Through Technology Creative Conversation on October 20, 2-4pm. The Beyond Dynamic Adaptability one-day conference took place October 24 at the Marines Memorial Theatre in San Francisco, and was co-hosted by Grants for the Arts, San Francisco Arts Commission, The San Francisco Foundation, and the Wallace Foundation, as part of the Wallace Foundation Cultural Participation Initiative. 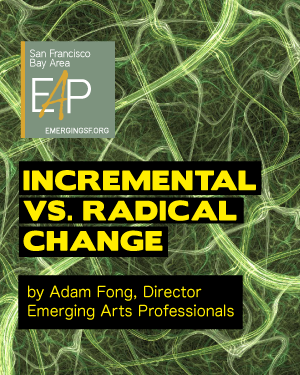 Adam Fong is the co-founder and Director of EAP; read his bio here.